Created on 2008-08-15 17:16 by jasonspiro, last changed 2014-05-10 17:53 by python-dev. This issue is now closed. until there is an actual patch to review. -  call start_component to create components "modify_path_per_user"
that, and I'm already tired of researching. verify a few things with you. python.exe will be gone, so will never be executed. Do you agree? know if that's a problem. Is it a problem? like telephone (I will pay the tolls) or instant messaging? I don't know if I will end up actually managing to come up with a patch. per-user or per-machine" to see why you need two rows. > python.exe will be gone, so will never be executed. Do you agree? > know if that's a problem. Is it a problem? > like telephone (I will pay the tolls) or instant messaging? for 2.7/3.1. In any case, I'll be away for the next three weeks. > It cannot remove them at uninstallation. path entry on uninstallation by means of a custom action. system32, or somewhere else that is on the PATH already)? turned off by default. So how should such customization be offered? Reopening this issue since #9228 was closed as a duplicate of this one. Given the significant level of user demand for this behaviour, it should NOT be closed again until a PEP has been written and either accepted or rejected. If such a PEP is not written and championed through to a final decision, then this issue should remain open indefinitely. Such a PEP should canvas the option of installing development shell launch scripts into the Start menu and updating the documentation accordingly as an alternative to messing with the system-wide PATH setting. An install-time option to allow power users to disable the PATH manipulation should also be considered. The interests of novice Python users and experienced Windows system administrators are not in alignment on this topic, and the current installer behaviour favours the latter at the expense of the former. Now, another factor to consider is that Windows 7 makes manipulating the system PATH even more difficult to do correctly (e.g. see http://www.symantec.com/connect/forums/wise-7-win-7-problems-updating-environment-variable-current-user). I believe ActiveState handle this by making the PATH modification optional and having it off by default (I found docs for ActivePerl stating this explicitly, but no equivalent for ActivePython). Regardless, for a product intended for heavy command line use, we should definitely do better in either providing a way for users to request that the installer modify PATH directly, or else a way to easily launch a command shell with PATH updated appropriately. > stating this explicitly, but no equivalent for ActivePython). ActivePython 2.x has it on by default. See tightly related ActivePython issue  regarding the way directories are added to the PATH environment variable. FWIW I have an installer built which optionally adds to the path. It's not complete - still needs some GUI work to hook it all up, but I'll be proposing it shortly. Helder: please don't change tracker settings unless you know what they are for. Python 2.6 and 3.1 can't possibly see any change here since they are in security fix mode, and can't see any fixes affecting this issue. Likewise, 2.7 and 3.2 will only see bug fixes. As the lack of supporting changes to Path isn't a bug (but possibly a missing feature), these versions can't see the bug, either. Putting 3.4 and 3.3 into an issue is just nonsense at this point: if the issue gets resolved for 3.3 before 3.4 is released, it will never be an issue for 3.4. Attached is an in-progress patch. I still need to figure out how to hook up the GUI to condition the path manipulation. A few locations have said to do conditional environment modification via the Component table, but I haven't been able to get some placeholder in there based on whether or not PREPEND is true/false from the GUI. Right now if you build an installer with this it will always modify the path even if you haven't chosen the option to do so. 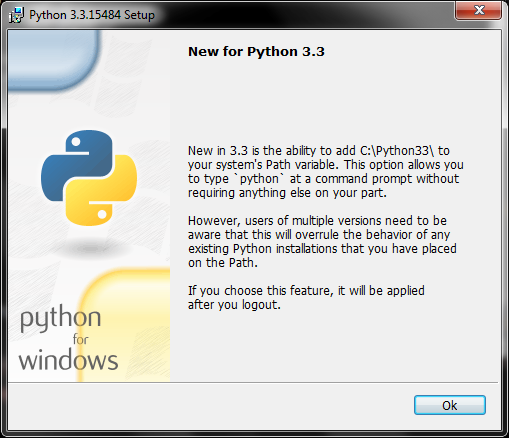 http://briancurtin.com/python-dev/python-3.3.15390.msi is an example installer. Note that it's not a signed installer, it's unofficial, and I don't support it whatsoever. It's merely provided as a sample of what the GUI looks like, and you can install it, see what happens, then uninstall and see that the path modification is properly undone. I just saw Brian Curtin's Pycon 2012 presentation. If a goal is to make it easy for new users to run python, consider installing a desktop shortcut. This would make it very easy for new users (easier than starting up a shell). This is independent of the Path changes discussed here. Those should be made (or not made) on their own merit, since most users will eventually need the Path to be properly adjusted. Attached is issue3561.diff which adds a path option, off by default, as a feature to be installed. I've tested installation and un-installation with the feature both installed and not installed and it seems to work fine for me. http://briancurtin.com/python-dev/python-3.3.15437.msi is an installer built with this patch. http://briancurtin.com/python-dev/CustomizePage.png is simply a screenshot of the page where you choose to enable this feature. (2)  What happens with multiple installations? Do users have to manually unset the path to avoid surprises? Does this become obsolete if the py.exe shim delegating to the appropriate py* is included with 3.3? Does installing 3.3.2 in over top of 3.3.1 add the directory to the path twice? UI-wise, I'm not sure why it looks like an installable component rather than a separate checkbox. Is it a limitation of the installation software? I unlinked the old diff. issue3561.diff is the one that matters. As for what happens with multiple installations, it's no different than how you'd already be managing it or anything else like it. If you install 2.7 with the path option enabled and then you install 3.2 with the path option enabled, 3.2 goes in front of 2.7. The installations don't touch each other. If we want to get smart and detect other installations on the Path, I believe this gets a lot more complicated. It does not become obsolete with the launcher. The launcher solves a wider problem in a different way. You could just switch to the launcher if you wanted to, but because we (probably will) have that feature doesn't mean the bare python.exe can't grow this functionality. People have been asking for it for years. It's the first step of every tutorial on the internet. It takes up a special page on the information for a sprint I just saw. As for the question of 3.3.2 over 3.3.1: I'm not sure yet. I'll build a few installers with different versions and run some upgrades to see what happens. We're using MSI's builtin ability to manage everything here, so I would imagine it knows what to do, but I'll confirm. > UI-wise, I'm not sure why it looks like an installable component rather than a separate checkbox. Is it a limitation of the installation software? I originally did it as a separate check box UI-wise but couldn't hook that into be an actual "Feature" in MSI terms. The way it's currently done allows it to be added to certain tables, allowing us to conditionally modify the "Environment" table which contains the optional path addition. I am by no means an MSI expert. This is just the way Martin and I talked about it at PyCon and the way I've seen it done around the web. If there's a way to tie a checkbox to the Feature table, I would like that. .py extension. That feature can be installed and uninstalled. IANANSOE (I am not a native speaker of English), but it seems to me that "Prepend path" is a bit terse, in particular since "Path" is being prepended *to*. 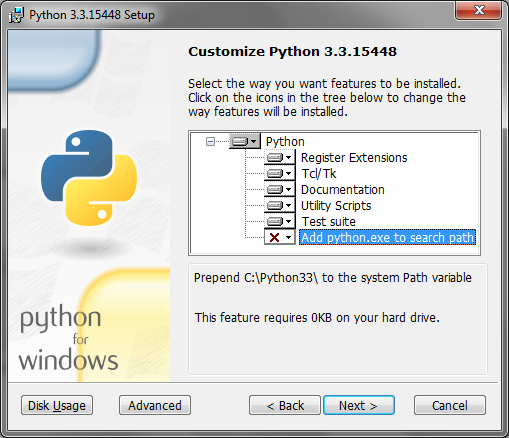 How about "Add python.exe to the search path"? That it is added to the beginning could be elaborated (i.e. prepended) in the feature description. Agreed. I will work up a more friendly text to go along with the feature. A minor thing: The capitalization of the feature names is inconsistent. 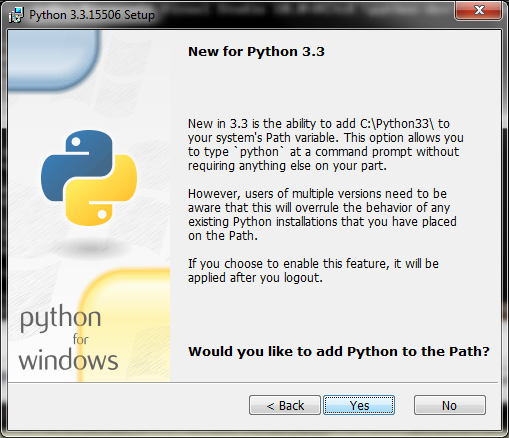 The attached patch changes the feature text to "Add python.exe to Path". I'm not sure the word "search" adds much there anyway. Prepend C:\Python33 to the system Path variable. This allows you to type 'python' into a command prompt without needing the full path. Brian: The patch is fine, please apply. Fix #3561. Add an option to place the Python installation into the Windows Path environment variable. Now that the feature is in, I'm going to track the few places we need to document it in #14668. I am really happy to see this as an option in the Windows installer. This has a potential to really reduce the support burden on training new Windows users to use Python and will really help normalize the experience for new users between Windows and POSIX platforms. Unfortunately, from what I can tell, this is OFF by default. I think that is a mistake. The default for something like this is really important because without new users being explicitly told to set it, new users will not. Most new Python users are just going to take the default values and still be confused by not being able to open the console and run python as in the instructions for various new user tutorials (i.e. web frameworks, scientific computing, etc). I understand the issue with installing multiple Python versions, but generally speaking people are going to want to install the latest version and have that be on their path. My sense is that there is a relative minority of Windows users that care about multiple versions of Python would not want their path to be updated. Unfortunately the ones who don't want their path updated are the ones that have driven the installer development at this point and will be most vocal in the Python community. I suggest a compromise which makes adding to the PATH default to ON if another Python version is not installed and/or on the PATH and default to OFF otherwise. http://msdn.microsoft.com/en-us/library/aa368012(VS.85).aspx which says you can do a search for an installed component and then set a property. This should then allow setting of the default state of the feature based on a condition. I really recommend that while we still have a chance to make a change that we think about the goal of this feature and whether making it disabled by default achieves those goals. lambacck: I'm -1, but I'm willing to yield to anybody who wants to be "in charge" of this feature (i.e. Brian, or the release manager). I'm not willing yield to "mere" user requests, as regular users won't have to deal with negative consequences that enabling this by default may have. I'm quite opposed to your proposed conditional approach; I think this will be highly confusing to users. The reason for the conditional approach was to attempt to account for the "negative consequences" of adding enabling this by default. i.e. if you are already a Python developer and install a new version, it will be status quo, but if you are a new Python developer then you will be able to run instructions for packages that work perfectly fine on Windows but are maintained and documented by POSIX users and don't understand that the steps to make things work on Windows are different. This tweet https://twitter.com/#!/zedshaw/status/194853198006198272 is characteristic of the sentiment that non-Windows users have about training Windows users to develop with Python. At the PyCon web summit several people who have been doing training lately have said that their solution is to get windows users to run a Linux Virtual Machine because the Windows Python experience is so bad for new Windows developers. This is one relatively easy place where we can make that experience better. > tutorials (i.e. web frameworks, scientific computing, etc). > If a goal is to make it easy for new users to run python, consider installing a desktop shortcut. > This would make it very easy for new users (easier than starting up a shell). > This is independent of the Path changes discussed here. Hi Jeff; thanks for the suggestion. Could you open another bug report for it? It’s much more manageable to have one request per report. Thanks in advance. 1) Great to see that this is finally done! 2) Is only Python installation directory added into PATH? Why not also Scripts directory under it as originally requested in this issue? As a developer of a Python based test automation tool, just adding Python into PATH doesn't help us because our tool's launcher scripts still aren't found unless PATH is manually edited. 3) I would also prefer this to be on by default. 2. Yes, only the installation directory, because that's the only directory we create. Scripts is created by distutils/packaging, but perhaps we could add it since it is widely used. Anyone have an opinion? 3. Do you have a reason? Many tools that offer path manipulation do not do so by default because it changes how the system operates. If we put this on by default, it will change how a lot of scripts are executed without people expecting it. It's easy to click through an installer like Python's because it's not flashy and there aren't a lot of options as it is. If we just let people click through, things are going to break a lot more than if we make people ask for it. I could see it becoming a default in a future release once it has been in the wild for a while, but I think we're going to run into a lot of problems if we just flip it right away. Being on by default would just be easier. If it's off, we still need to separately instruct users to turn it on. That's obviously a lot easier than instruction them to change environment variables, so I don't feel too strongly about it. Not adding Scripts into PATH, on the other hand, would make this enhancement pretty useless for us. If it's considered confusing that the installer adds a directory it doesn't create into PATH, perhaps the installer could be changed to also create that directory. For 3, installing the PEP 397 launcher will be the long term "on-by-default" solution. For 2, adding the Scripts subdirectory seems reasonable. FWIW, Window used to have *very* severe restrictions on the maximum length of PATH, as well as gratuitously long names for standard executable file locations. This made conscientious developers understandably reluctant to mess with PATH, because adding to the start could break other elements of the user's system, while adding to the end wasn't reliable. This is much less of an issue these days, as Windows is a lot more tolerant of ridiculously long PATH definitions. be a method on Directory. I'm strongly opposed to enabling this by default at least for 3.3, but does anyone think something like this dialog http://i.imgur.com/18zPD.png be helpful? After choosing the directory to install to and before choosing the features, it's a simple dialog explaining that the Path feature is available and what it does. > consequences that enabling this by default may have. > I think this will be highly confusing to users. choice, if it is feasible. (1)  The default is "What you are already doing." path, as many newbies would. problem, rather than the application's? > does anyone think something like this dialog http://i.imgur.com/18zPD.png be helpful? > feature is available and what it does. So I have a patch that does most of what my previous message shows, but I can't seem to complete it. I don't know if I'm misunderstanding something or this just can't be done, but I could use the help of someone who understands MSI things much better than I can. Attached is the patch which makes this (http://i.imgur.com/415Y1.png) screen possible. The problem is that I can't seem to hook up the Yes and No buttons to set the path feature to install or not on the next screen, the Feature selection page. http://ubuntuone.com/1GfW3hasOIDydQEAweOoKr is a link to an installer built with that patch if anyone wants to click through and it and see if it's worth adding in that form. These things are best studied with msiexec ... /l*v python.log, then inspecting python.log. Without looking at the trace, I'd expect that the actual installation run doesn't inherit ModifyPath from the UI run. The installer runs actually twice - once in the user account, performing the UI sequence and collecting all information. Then in the context of the installer service, running the execute sequence to modify the system. Information is passed in properties. However, not all properties are passed, only secure properties (which I believe must be UPPERCASE, in addition to being listed as a secure property). Write a VB script, and call Session.FeatureRequestState. Associating this event with the "Yes" button should make the feature selected. Note that you can have multiple control events for a button, so you can proceed to the next dialog after having this control event. instead. This is doing something completely unexpected to the user. and leaving the [ Next > ] and [ Cancel ] buttons as-is. prepend-Python-to-PATH option be selected by default. you can see if the tech-support burden increases or decreases. I don't think it's that unexpected. I certainly didn't come up with the idea myself - I've seen them before. Surely it might be new to some people, but is it confusing? For one, we think it's an option users should know about. It's also an option that you should explicitly enable. The yes/no seemed like an easy way to ask a yes/no question if you want it. My first iterations of this patch used a checkbox in an additional window. I guess it's a possibility. If I can even figure out how to make any of this actually work, I'll try a version with a checkbox. We can't make it the default. This has been explained on this issue, other issues around the tracker, on python-dev, and in a lot of other places. Believe me, as one of the biggest Python 3 advocates you can find, making Python 3 the default installation is not the right move here. If it's on by default, it absolutely will cause problems because people just click right through the installer and their system will be modified in a way that they don't want and potentially won't know how to undo. This type of change has to be exposed in a loud and non-default way to start. Next > ], and [ Cancel ] buttons onscreen. you could safely modify the PATH variable by default. We don't need to stay with some paradigm if it's not the best way. If I can get any of these ways to work, I may post some type of survey on python-dev. Adding to the end wouldn't make this much of a feature. Most users have already put another Python into their path, so if they decide they want to add 3.3 to it, this option barely helps them. Anyway, just about everything relating to this feature has been discussed on the above mentioned lists over a long period of time. The feature is implemented as is, it has already been released, and it's staying that way for 3.3. All we can do is tweak the GUI. non-experts who don't even know what a PATH is. of the PATH by default. This'd help those non-experts a lot. > add 3.3 to it, this option barely helps them. > for 3.3. All we can do is tweak the GUI. Can this issue be closed? If there are still disagreements about the UI or UX, it could be a separate 3.4 report. As Eric says: any further issues with this change should be reported separately.